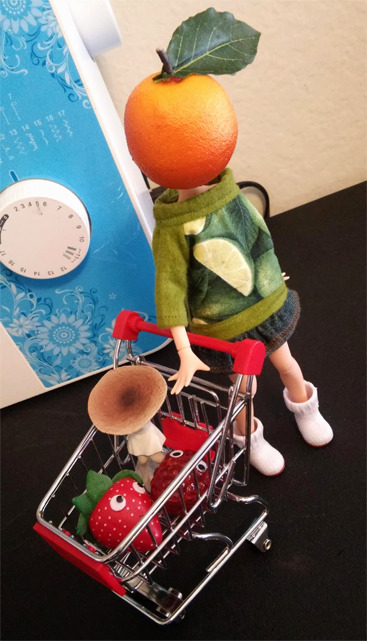 I am a huge fan of Object Heads--I draw them all the time--and when I saw this incredible TV head by TeethTorn on Tumblr I knew I had to have one in doll form. This is actually part of what got me back into the dolly scene after years of absence from the Blythe community! I love TV heads of course but they're not really so much my style, and anyway those TVs are impossible to find now. Luckily my preference (after a brain in a jar, which is next on my list) is for simple objects, and especially I like "organic" object heads: terrariums (I want this soon! I already got a jar! It's going to be a real, functional terrarium) and flames and crystals and FRUIT. All of which can be acquired at doll scale pretty cheaply. She is very much a WIP. 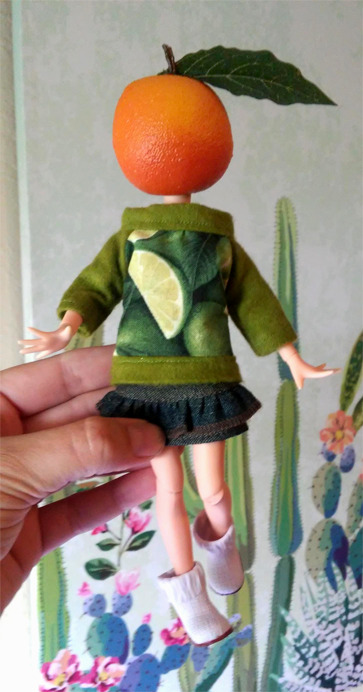 I'll be ordering a her a Pure Neemo body--I have an XS in the mail for my Licca and I'm going to see whether I prefer that or if I want a S--so right now she's on a baity stained Blythe body! I haven't messed with her neck joint much either so she's just kinda perched on there, hence the gap--I'll be more careful with the Neemo. And probably end up shortening the neck some. I haven't decided yet whether to permanently affix the leaf or make it detachable (her "wig" xD), but I'll probably go with the latter with a flat-head straight pin painted green to hold it in place (as the fruit is a sort of hardish foam that takes needles/etc. well; it's actually held on with an earring right now). In any case I'm going to buy a more realistic orange leaf. I really liked this orange but the leaves are cheap and bad looking and I want a nice one! tv head dolls? I never saw them before but I am not that e erienced. looking forward to the terrarium! that would be magical. She is one of the cutest and most unusual dolls I have seen around. She looks adorable already, I would love to see her all finished. I think its a great idea. That's an interesting idea! I've never heard of TV heads, either. Thank you all! I will keep updating as I get her body and e and her look going to stitch up some crop top and skirt sets for her tomorrow if I can find time. I'm excited for her. Kinda wanna do some other fruits and keep them in a bowl, haha. I confess I had never heard of Haint Blue. Now that I know what it is, maybe your presence will keep the trolls and spammers away from the forum. I have gotten some new leaves for her! Still e erimenting with how best to attach them, so the stem area is a little hectic. Her head is very lightweight! Not going to have time to sew for her today, so I just changed her clothes. She looks full of character already. I'm really thrilled! I'm gonna get an S size in white skin and make her a peach-headed girlfriend, I believe. Her new body and new tshirt are super cute! I think this idea is really great translated into doll form! I love your object head girl! I've actually always wanted to do this!!! I think the idea is so cute and I might have to make one for my Licca girls!! I think there so fun!! Ahhh thanks guys! Yes please make some! 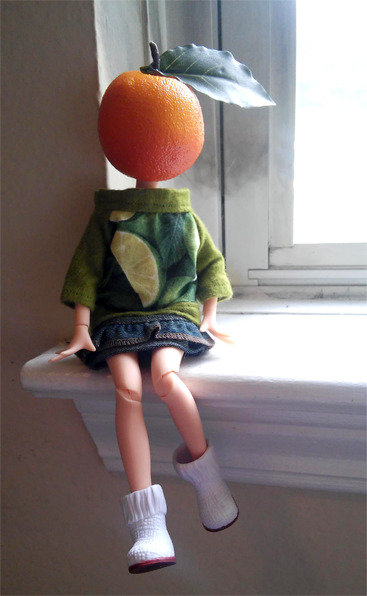 I want to see everyone's object heads @_@ I am going to make a peach next, named Savannah or Roswell. Took me a while to find a good peach in the right size but I did! 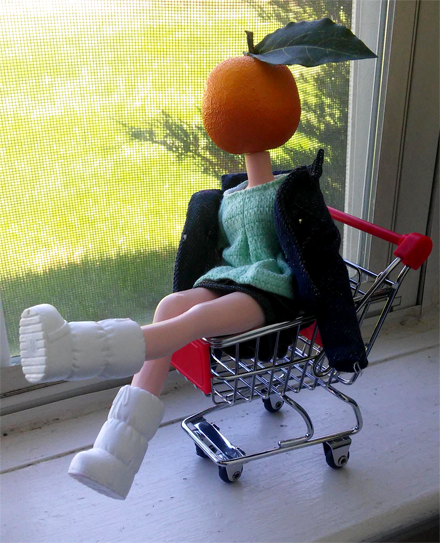 This is such an interesting idea, I never thought I'd be calling an orange cute before. I especially love her with her new body, but I have an extreme adoration for PureNeemo's in general. But yes, very very cute and creative! I can't wait to see your Peach girl as well!